Comodo Internet Security records a history of all actions taken by the Firewall. These can be viewed by clicking 'View Firewall Events' from the ' Firewall Tasks' area. Firewall ‘Events’ are generated and recorded for various reasons - including whenever an application or process makes a connection attempt that contravenes a rule in your Network Security Policy, or whenever there is a change in Firewall settings. By default, CIS stores the log file in Support DataBase (SDB) format as cislogs.sdb file which is located in C:\Documents and Settings\All Users\Application Data\Comodo\Firewall Pro. Logs stored in this file can be extracted by using a suitable application. Logs can also be exported to html by clicking ‘More.. > File > Export’. Click 'View Firewall Events' in the common tasks of Firewall task center. Action - Indicates how the firewall has reacted to the connection attempt. Protocol - Represents the Protocol application attempted to use to create the connection. This is usually TCP/IP or UDP - which are the most heavily used networking protocols. Source IP - States the IP address of the host that made the connection attempt. This is usually the IP address of your computer for outbound connections. Source Port - States the port number on the host at the source IP which was used to make this connection attempt. Destination IP - States the IP address of the host to which the connection attempt was made. This is usually the IP address of your computer for inbound connections. Destination Port - States the port number on the host at the destination IP to which the connection attempt was made. Date/Time - Contains precise details of the date and time of the connection attempt. Click 'Refresh'to reload and update the displayed list, to include all events generated since the time you first accessed the 'Firewall Events' area. 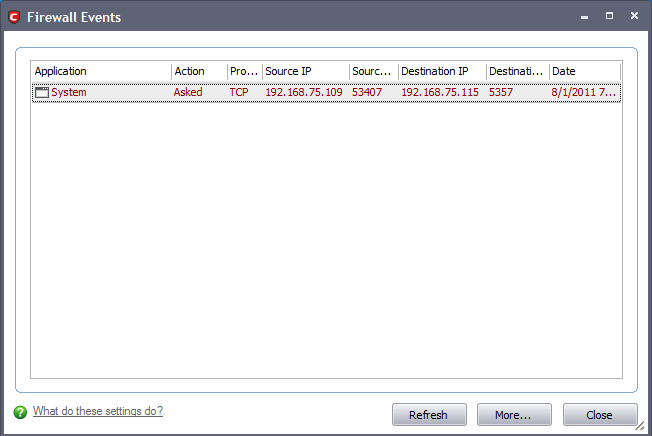 Click 'More ...' to load the full, Comodo Internet Security Log Viewer module. See below for more details on this module. 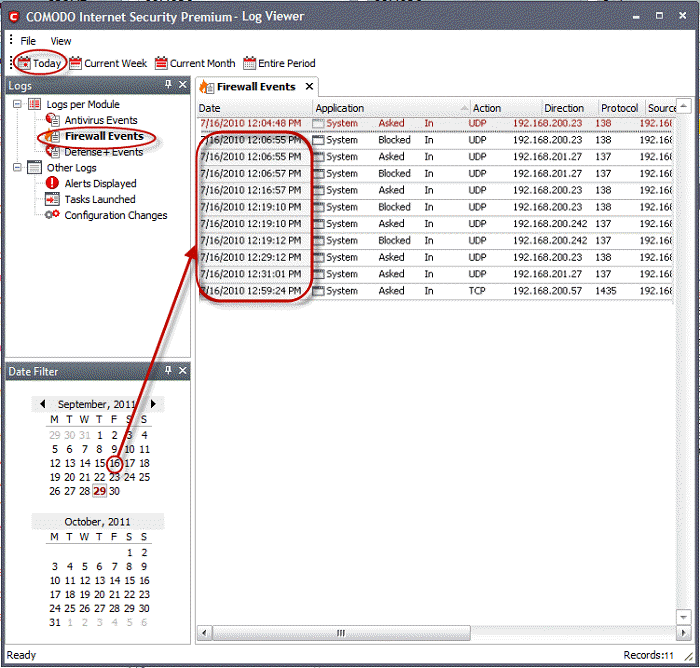 Click 'More' to load the full, Comodo Internet Security Log Viewer module. Alternatively, this module can be opened by double-clicking the 'cfplogvw' exe file that is stored in the installation path of the CIS application. Usually the path is C:\Program Files\COMODO\COMODO Internet Security. This window contains a full history of logged events in two categories: Logs per Module and Other Logs. It also allows you to build custom log files based on specific filters and to export log files for archiving or troubleshooting purposes. The Log Viewer Module is divided into three sections. The top panel displays a set of handy, predefined time Filters. The left panel the types of Logs. The right hand side panel displays the actual events that were logged for the time period you selected in the top panel and the type of log selected in the left panel (or the events that correspond to the filtering criteria you selected). Alerts Displayed: Displays the list of various alerts that were displayed to the user, the response given by the user to those alerts and other related details of the alert. Tasks Launched: Displays the various Antivirus tasks such as updates and scans that have taken place. This area will contain a log of all on demand and scheduled AV scans and the result of that scan. Configuration Changes: Displays a log of all configuration changes made by the user in the CIS application. 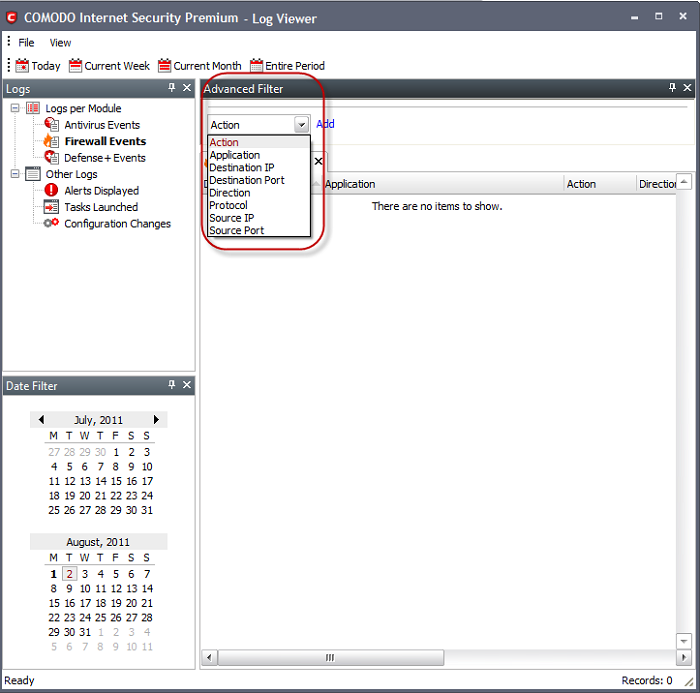 Comodo Internet Security allows you to create custom views of all logged events according to user defined criteria. The example below shows an example display when the Firewall Events for 'Today' are displayed. Note: The type of events logged by the Antivirus, Firewall and Defense+ modules of Comodo Internet Security differ from each other. This means that the information and the columns displayed in the right hand side panel change depending on which type of log you have selected in the top and left hand side panel. For more details on the data shown in the columns, see View Antivirus Events or View Defense+ Events. Custom Filters can be created through the Advanced Filter Interface. You can open the Advanced Filter interface either by using the View option in the menu bar or using the context sensitive menu. Click View > Advanced Filter to open the ‘Advanced Filter’ configuration area. Right click on any event and select 'Advanced Filter' option to open the corresponding configuration area. The ‘Advanced Filter’ configuration area is displayed in the top half of the interface whilst the lower half displays the Events, Alerts, Tasks or Configuration Changes that the user has selected from the upper left pane. If you wish to view and filter event logs for other modules then simply click log name in the tree on the upper left hand pane. The Advanced Log filter displays different fields and options depending on the log type chosen from the left hand pane (Antivirus, Defense+, Firewall). This section will deal with Advanced Event Filters related to ‘Firewall Events’ and will also cover the custom filtering that can be applied to the ‘Other Logs’ (namely ‘Alerts Displayed’, ‘Tasks’ Launched’ and ‘Configuration Changes’). The Antivirus and Defense+ Advanced Event Filters are dealt with in their respective sections. You have 8 categories of filter that you can add. Each of these categories can be further refined by either selecting or deselecting specific filter parameters or by the user typing a filter string in the field provided. Click the ‘Add’ button when you have chosen the category upon which you wish to filter. Action: Selecting the 'Action' option displays a drop-down box and a set of specific filter parameters that can be selected or deselected. Select 'Equal' or 'Not Equal' option from the drop-down box. ‘Not Equal’ will invert your selected choice. The filtered entries are shown directly underneath. Direction: Selecting the 'Direction' option displays a drop-down box and a set of specific filter parameters that can be selected or deselected. Note: More than one filters can be added in the ‘Advanced Filter’ pane. After adding one filter type, the option to select the next filter type automatically appears. You can also remove a filter type by clicking the 'Remove' option at the end of every filter option. Refer to Antivirus Tasks-Introduction > View Antivirus Events > Log Viewer > Creating Custom Filters > Other Logs – Advanced Filters for the process of Creating Custom Filters for Alerts Displayed, Task Launched and Configuration Changes. Click here to know more about Date Filter functionality. Exporting log files is useful for archiving and troubleshooting purposes. There are two ways to export log files in the Log Viewer interface - using the context sensitive menu and via the 'File' menu option. After making your choice, you are asked to specify a name for the exported HTML file and the location you wish to save it to. Select the event for which the log report is to be taken. Click 'Export' from the File menu. Select the location where the log report has to be saved, provide a file name and click 'Save'. Right click in the log display window to export the currently displayed log file to HTML. You can export a custom view that you created using the available Filters by right clicking and selecting 'Export' from the context sensitive menu. You will be asked to provide a file name and save location for the file.